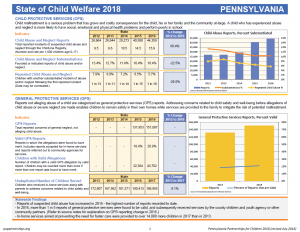 PPC annually compiles State of Child Welfare data to gauge the performance of Pennsylvania’s child welfare system in meeting the needs of the children and families the system serves. We gather comprehensive data for each of the 67 counties, including information on foster care placements, children leaving or re-entering foster care and efforts to reunify children with parents or relatives. 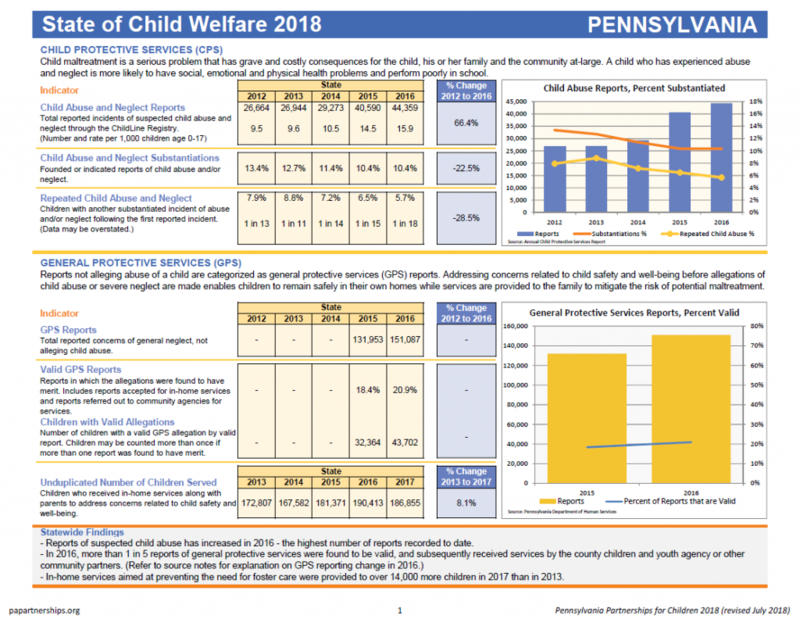 PPC initially released the 2018 State of Child Welfare data in March 2018. After the release, the Pennsylvania Department of Human Services (DHS) identified the General Protective Services (GPS) data we published did not align with our definitions. Working with DHS staff, we revised the GPS section to correctly provide the total number of GPS reports, the total number of valid GPS reports, and the number of children associated to valid allegations on valid GPS reports for both 2015 and 2016. Our intent is to continue reporting these indicators with all future State of Child Welfare releases. We apologize for any inconvenience and hope you find the revised GPS data to be useful. Foster Care Entries by Age: In 2017, 1 in 3 children entering foster care for the first time were in the 0-2 age group, which has consistently remained the largest age group represented in first-time entries for the past five years. These youngest children are often considered some of the most vulnerable to abuse and neglect by Children & Youth agencies due to their complete dependence on parental caregivers. Interruptions in caregiving at such a young age can be especially challenging in the first three years of life, which are regarded as crucial for infant brain development, temperament and emotional skill-building. According to the federal Adoption and Foster Care Analysis and Reporting System (AFCARS) 2017 data, the number one reason children were removed from their families and placed in foster care was parental drug abuse. For children of this age, early services to the family are crucial in helping to mitigate trauma and ensure child safety. Foster Care Placement Settings: Pennsylvania has been steadily improving when it comes to placing children in foster care into family settings, rather than in group homes or institutions. But, we can do better. The majority of these settings in 2017 were with non-relatives, and this was true at all points of the foster care system – entry, all children served, children served on the last day of the reporting period and children who re-enter the foster care system. Pennsylvania has two statewide practices that focus on placing children in foster care with a relative or kin: family finding, where caseworkers make every effort to identify and locate relatives willing to serve as foster parents; and, Family Group Decision Making, where family members are included in the team that helps decide the best plan for a child in foster care. These efforts have been proven to increase the likelihood that a child who must enter foster care will be placed with someone they already know and trust. This is just one benefit of placing children with relatives. Others include a higher likelihood that siblings will remain together, less placement moves, less behavioral challenges, decreased mental health needs and increased family and community connections. Often called kinship care, relative foster home placements should be prioritized when placing children in foster care. Timely Reunification and Failed Reunification: Our state’s percentage of timely reunification, defined as children who were reunified with their parents or discharged to relatives within 12 months of entering foster care, increased to over 39% in 2017. Further, Pennsylvania’s rate of failed reunification, or when a child re-enters foster care within 12 months of reunification or discharge to relatives, was the lowest recorded to date and has decreased over 13% over the past 5 years. This is good news as Pennsylvania has lagged behind other states on this measure and it indicates that the child welfare system is improving when it comes to appropriately addressing family needs and minimizing the time a child spends in foster care away from their birth families.